Cedar Mountain has been providing customers in and around Helena, MT with top quality spa covers and excellent customer service for more than 35 years. We plan to continue this long standing commitment to old and new customers indefinitely. There are currently two distribution locations in the Northwest (Idaho and Washington), and there are more than 150 dealers around the nation, ready and willing to help you meet all your spa cover needs. Helena is the capital of Montana established in 1864, and this city was founded during the “gold rush”. 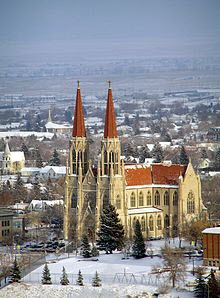 Over a period of 20 years, more than $3.5 billion dollars in gold has been extracted from the area, and this in turn, made Helena one of the wealthiest cities in the United States during the nineteenth century. This excessive wealth contributed greatly to the beautiful Victorian architecture in the region. As of the formal census of 2010, the population of Helena was about 28 thousand. The local newspaper, which is printed on a daily basis, is the “Independent Record”. Sports fans would likelyknow that the Helena minor league baseball team is known as the “Helena Brewers”, and the local hockey team is the “Helena Bighorns”. Mount Helena City Park, which is 620 acres of beautiful land, includes six trails to be enjoyed by all. Local volunteer groups and the City of Helena are dedicated to maintaining this park, by keeping it clean and safe. Parking is always free. Sleeping Giant Wilderness Study Area is situated about 30 miles north of Helena, and it is a quiet recreational area that is free of motorized vehicles. There are more than 6,600 acres of land and about 50% is wood land. Canyon Ferry Lake is the third largest body of water in the area, and it covers more than 35 thousand acres. This lake was formed as a result of the building of the Canyon Ferry Dam (which has been used for irrigation, food control, and electricity, since its completion in 1954). This lake is loved by all, and it is a very popular destination for fishing, spending a leisure day on a boat, and/or simply enjoying the surrounding wildlife. It is also a main venue for iceboat races. Also, Canton lies beneath this lake, as this town was submerged after the completion of the dam. There are currently 150 Cedar Mountain spa cover dealers all around the United States. You can find many in the Helena, MT area. To find a dealer near you, visit the dealer locator page. We would love to have you as part of the amazing team of spa cover dealers in Helena. For more information about the company, and to find out more about how to bring the highest quality of American made spa covers to your customers, please call: 208-772-9176, or start by filling out the simple “new dealer registration” form.